I've been abysmal at taking outfit photos this week! To tide you over till I get back into my groove, I reached into the archives and found this outfit from awhile back. If I remember correctly, I wore it a few weeks ago to the farmers' market. Though I have nothing to show for it, getting dressed this week has been a blast. It's as if the start of fall coincided with the beginning of September. That never happens! The chilly mornings and evenings with ideal afternoons in between have me on cloud nine! 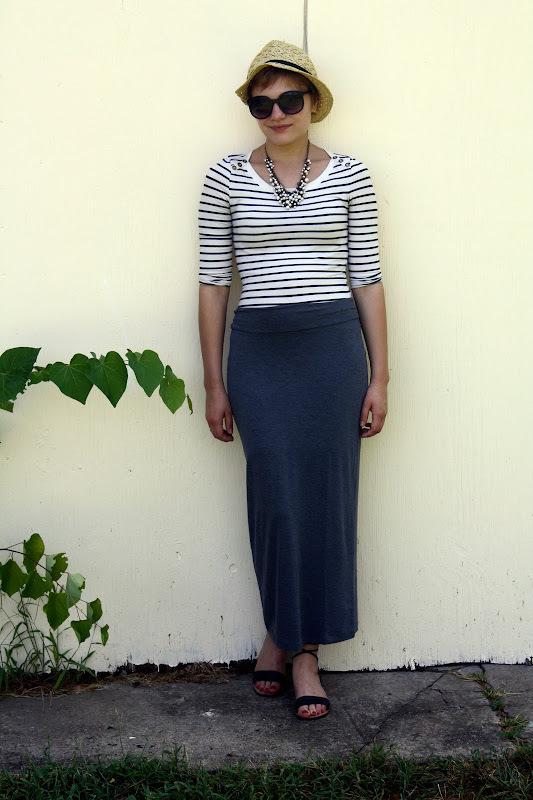 I love the long maxi skirt with the stripes! Gorgeous color to that skirt. Looks perfect with the stripes. your hair makes this simple outfit so chic and polished. lurve. i love this, so casual and summery! you look fab in the maxi skirt. Loving the hat-necklace-shirt combo :) I don't think I would have thought of pairing those 3 together, but I am LOVING the way it looks! I'm in complete agreement about the arrival of Fall. Hurray! Ah, this is such a fabulous outfit! The form-fitting top really accentuates your tiny waist, and I'm all about the maxis this year. Great outfit. Stylish, super cute. love the outfit keep it simple.